If the holidays are a time for reflection, the new year brings an opportunity to set new goals for the year ahead both personally and professionally. You may have personal fitness ambitions or plans to develop a new marketing skill, but have you thought about how you will go about achieving these goals? Perhaps the key to achieving a goal is in how you set the expectation at the outset. Human relations departments will commonly ask employees to set “SMART” performance goals, an acronym for: specific, measurable, achievable, relevant and timely (Mindtools.com, SMART Goals). Outlining these five areas helps bring concrete action to goals which can be overly broad. It is sound advice for anyone or any team setting goals this year, especially if you will be responsible for reporting the results. How can your team set SMART goals for its internal communications strategy this year? Let’s look at each letter of the SMART goal system and apply it to a common internal communication goal: increase employee engagement. The goal should be clear and simple. One way to gauge whether a goal is specific enough is to put it through the five “W” questions: who, what, where, when, why (Smartsheet, 2015). If the goal cannot answer these questions in a very straight-forward way, then work to clarify it even more. When we put the goal of “increasing employee engagement” through the five W questions, it feels somewhat general. Let’s get specific. Who do we want to see increased engagement from? What tactics will we use to engage them? Where will they see these tactics? When will we achieve results? And perhaps most importantly, why do we want to see increased engagement? Whether for personal satisfaction or to justify the efforts for next year’s budget, goals should be measurable. It is important to have tangible evidence that the goal was achieved. Measurability is also key to gauging progress and staying motivated as a team works towards a goal. For long-term goals, it may be helpful to set milestones along the way. To increase employee engagement, what are the data points being measured that will prove your efforts are working? If the primary method of employee communication is email, it may be helpful to track open rates, read time and article click-through rates. Employee surveys and questionnaires can offer insight into behavioral and attitude changes. And perhaps most importantly, measure how the messaging has affected employee outcomes (Ragan, 2015). An achievable goal does not necessarily mean an easy goal. The idea is to set a realistic goal that will stretch your abilities and improve you for the long term. Take an honest look at the human and financial resources available to help achieve the goal. These factors are often outside your control and need to be considered up front. Does your team have the tools and manpower it needs to implement its strategy and achieve your IC goal? How much time can realistically be dedicated towards achieving this goal? Achievable goals understand the current situation and look for realistic steps to move towards the goal. Assess the current level of employee engagement before deciding what to strive for. A relevant goal is one that makes sense with a company’s broader business goals. Look at how the goals of your internal communication strategy tie into the overall business strategy, and ultimately, the bottom line. How does the goal help the individual and the company as a whole? Does this goal match the company’s other efforts and needs? Internal communications are relevant to employees at all levels, but certain messages and goals may be more relevant to a specific segment. Consider how a message will be relevant to the target audience. Related to both “specific” and “measurable” is the timeliness of a goal. A SMART goal has a defined start and end date with checkpoints along the way. Find a timeframe that allows enough time to be completed but is not so distant that it will be procrastinated. Break long-term goals into manageable chunks that keep the goal towards the top of your to-do list. This can help daily priorities from impeding the progress of achieving long-term goals. If the goal is to increase employee engagement by the end of Q4, what will need to be done in the preceding quarters? When will you gauge your progress and adjust the strategy? Increasing employee engagement and changing behavior happens incrementally— allow enough time for your efforts to soak in to see (and measure!) the desired impact. Setting SMART goals will help guide your internal communications strategy for the coming year. And if your strategy needs a boost to achieve your SMART goals, RMG provides digital solutions and expertise geared to meet your needs. 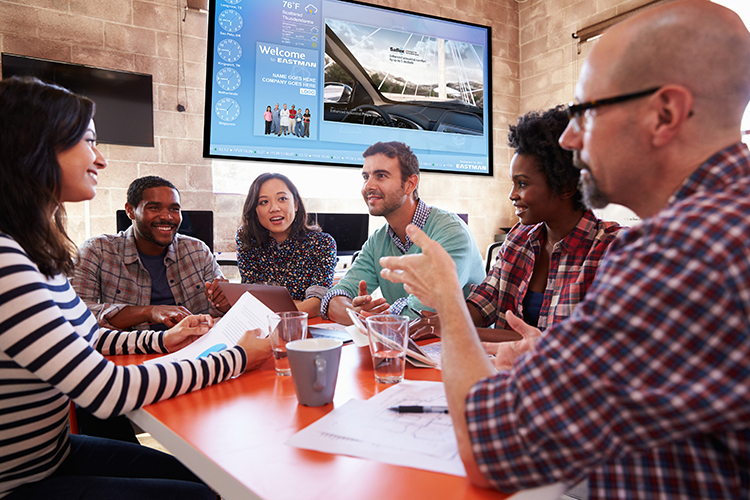 Our software solution Korbyt™ leverages digital signage, desktop and mobile devices to engage employees and align communications with one platform. Reach out today to schedule a demo.